Commercial strength equipment engineers have long looked for a way to efficiently train the lower body as a complete unit. 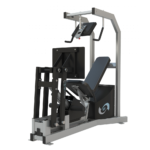 The Exerbotics Leg Press (eLP) is a functional Iso-Velocity machine allowing for true force output testing and training for the lower body, multi-joint movement. Entry and exit is easy with a wide open design and oversized seat pad. The computer controlled range of motion and user applied force makes testing heavy loads concentrically and eccentrically safe and uninhibited. 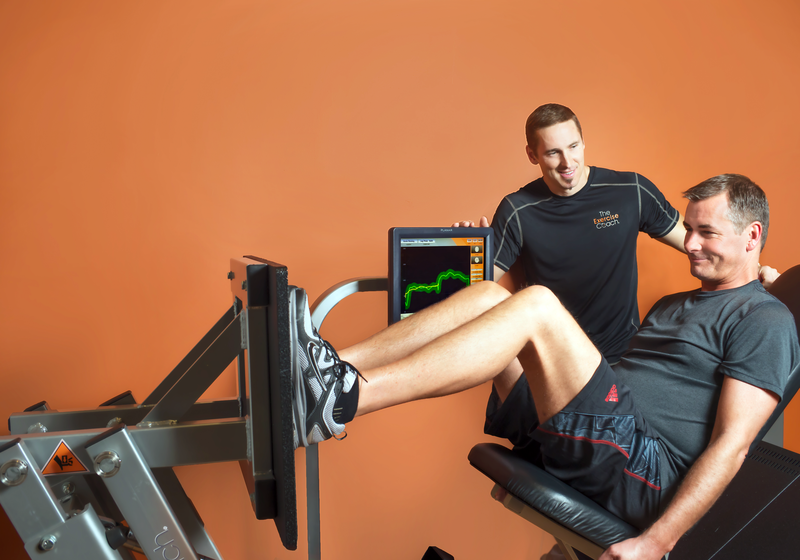 The eLP can test legs independently or together for added variety in assessment and training. The arching movement incorporates quadriceps, hamstrings and glutes for an encompassing lower body experience. Personally, the Leg Press is my favorite machine. Not only does it look cool with the latest upgrades: an overhead monitor and handles, but it is really a great piece to use. 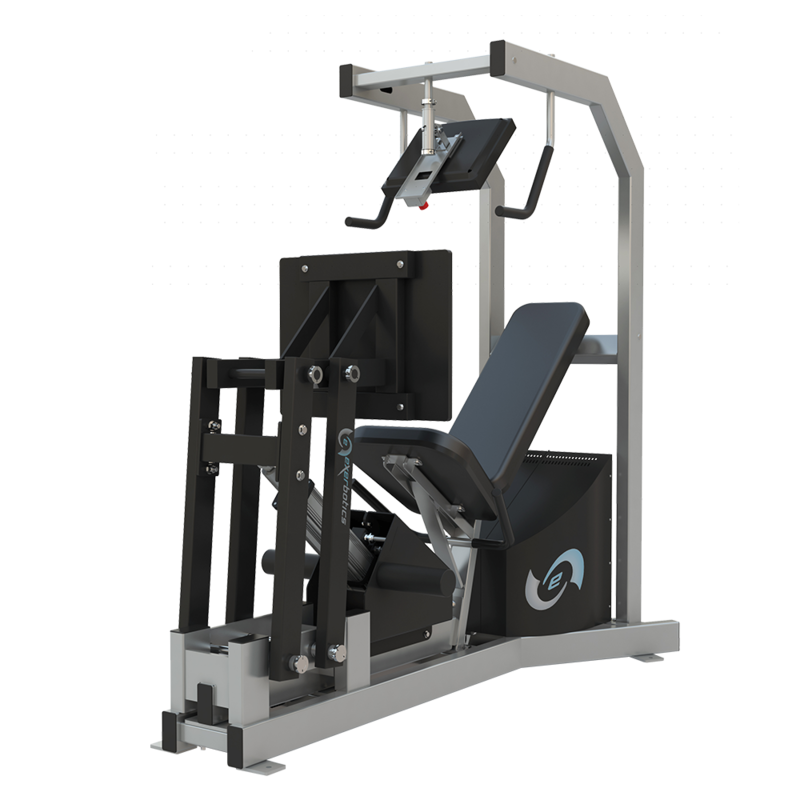 Since the addition of the Squat, it has been moved into second place as the most challenging machine. This unit has seen the most changes in product evolution as we have continued to tweak it to make it exceptional. The overhead monitor swivels so the trainer can easily access the screen and adjust it to perfect alignment for the user. This makes this machine reasonably narrow and easy access from both sides. Originally the handles on each side of the monitor were designed for assistance in and out of the machine (and to prevent clients from grabbing the monitor). An unexpected but significant observation is that users prefer holding those handles while exercising. I have found that to be a significant comfort upgrade. Overall, I love this machine because of it’s versatility. It can train anyone but being able to get an accurate measurement on a closed chain, lower body movement has never been done in this manor. Additionally, allowing someone with limited lower body functionality from age, injury or a neuromuscular disorder to safely engage in activity, strengthening and movement is an exciting feat. I personally use this machine regularly to increase strength and muscle endurance. I like to run and find it difficult to get the strength training I need during the running season. Since implementing this machine into my routine every 5 days, my strength in climbing long hills and maintaining stamina throughout a long run has been significant and noticeable to those around me.